Let's be real. Chicagoans don't do things by the book. When it came to creating an epic green space that would unite the city, a "been there, done that" attitude wouldn't fly. NYC's Central Park? Meh...it's ok. A little boring, but ok. But we're Chicago. We can do it better. Enter Millennium Park. An awe-inspiring collection of impressive landscape, architecture and public art that defies expectations. Starting with "The Bean" where you can check out your reflection (and the Chicago skyline) in its massive, mirror-like surface. Skate under twinkling lights at the McCormick Tribune Ice Rink in the winter. Cool off in Crown Fountain during the hot city summers. 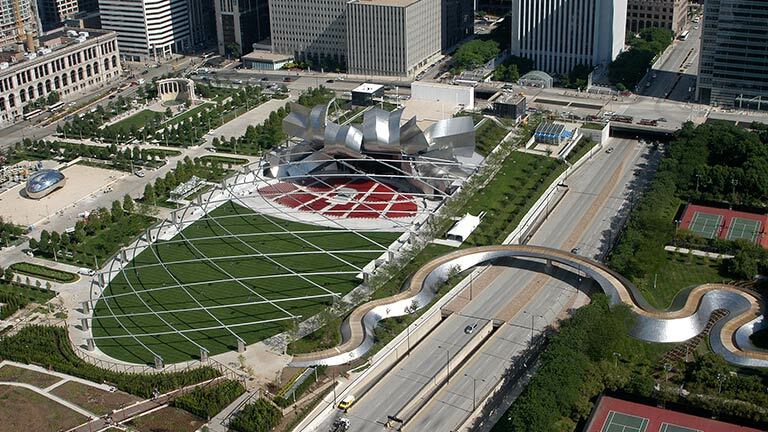 Enjoy a variety of fabulous Millenium Park events, like concerts, group fitness and art exhibits. All this less than a mile away. Free. Free. Free. Did we mention, free? Get your green on anytime of the day or night. Open all the time. What are the must-see spots in Millenium Park? Start at Cloud Gate (a/k/a The Bean) at the entrance to the park. This massive stainless steel sculpture reflects the city's skyline in its mirror-like surface, perfect for photo ops. In the summer months. head over to Crown Fountain and splash in the shallow reflecting pool bookended by two 50-foot towers. Pritzker Pavillion is the scene for live performances. Lurie Gardens offers an urban oasis that pays homage to Chicago's motto of City in a Garden. Wintertime beckons you to lace up your skates and show off your skills at the McCormick Tribune Ice Rink. And if you've built up an appetite, head to the afresco patio Park Grill for delicious food and drinks. Is there parking available near Millenium Park? If you're not walking to Millennium Park from ACME Hotel Company (and we're not sure why you wouldn't be, because it is less than a mile away...but we digress), you can park your ride at the Millennium Park Garage, located directly under Millennium Park at 5 Columbus Drive. With 1 million square feet of parking space and 2,126 designated spots, you're all set. But don't bring your big rig, because the vehicle height clearance is 6'8".